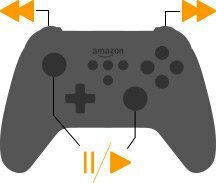 If you want to play games, the Amazon Fire TV Game Controller is the perfect companion to your Amazon Fire TV. Kick back on your couch with your friends for a cinematic gaming experience on your TV. The second generation Game Controller has been ergonomically designed for greater comfort and more responsive performance. The control layout is instantly familiar to any gamer, and intuitive to those who have never held a controller before. Enjoy your games, movies and music without distractions. 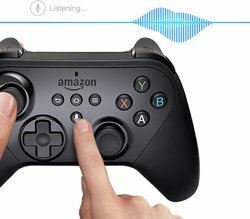 Simply plug your headphones into the jack, and enjoy any audio coming from your 2nd generation Amazon Fire TV. Rich, true-to-life Dolby virtual surround sound provides an immersive listening experience. Also, with the Game Controller you can adjust the volume of the experience by using the onboard trigger buttons. Instantly find your favorite games, TV shows, movies, and more from Amazon using integrated voice search. Simply hold the button and speak into the controller. And now, you can also get news, weather, and more on your Fire TV with Alexa, the brain behind Amazon Echo. Alexa is a cloud-based voice service that provides information, answers questions, plays music, checks sports scores or the weather, and more — instantly. It adapts to your speech patterns and personal preferences the more you use it. And Alexa is always getting smarter with new capabilities like traffic reports, Amazon.com reordering, and streaming music from Pandora. 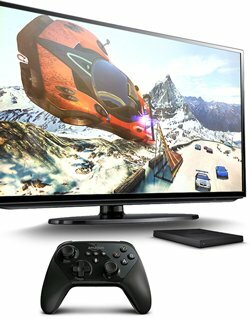 The Game Controller also works as a remote for your Fire TV. Use the joystick to effortlessly browse through your apps, music, and movies, and select with the push of a button. Intuitive playback controls allow you to play, pause, fast forward, and rewind, all from the comfort of your couch. Choose from an ever-growing library of games optimized for your Game Controller. With titles from Rockstar Games, EA, Disney, and more, we have something for every gaming style. Get your blood pumping with Tales from the Borderlands, ball out with the pros in NBA2K15, get nostalgic with Sonic the Hedgehog, or explore the vast, open world of Star Wars: Knights of the Old Republic. 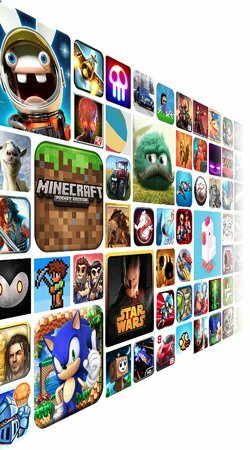 Our catalog includes hundreds of free titles, with many more priced from just 99 cents. 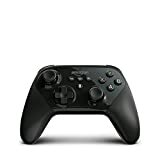 While there are hundreds of games that work with the remote included with your Fire TV, there are hundreds more that require a Game Controller. Click here for a full list of games. 6.2" x 4.1" x 2.3"
Compatible with the Fire TV Stick (not compatible with Fire TV with 4K Ultra HD - Pendant Design, Fire TV Stick 4K, Fire TV Edition smart TVs, or Fire TV Cube).